Just like you can listen to music while you are driving a car, you can do it while you ride a motorcycle. There are audio systems that are made specifically for this purpose and they are usually designed for the handle bars of motorcycles. Bikes don’t come with integrated audio systems, so you have to acquire such a system to be able to listen to music while you are riding. You have to face two issues though: a motorcycle doesn’t have too much room for speakers and amplifiers and the handle bars are exposed to different weather damages. These problems can be solved by making motorcycle speakers small and weatherproof. The speakers can be installed directly on the handle bars, so the wind can direct the sound to the rider’s ears. In this way, the rider can also have easy access to controls. Because of the way these speakers are used, they have to be manufactured a bit differently than speakers used in cars or homes. When you are shopping for motorcycle speakers, there are certain factors to take into consideration. Choosing such products is not always easy. 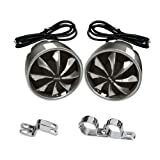 Once you know how much money you have to buy motorcycle speakers, your list of choices automatically becomes shorter. Things can become easier, as you will better know your priorities from the beginning. Your expectations should be realistic, especially when the budget is low. Speakers for handle bars are not the only type of motorcycle speakers, as there are also Bluetooth audio systems and helmet audio systems for motorcycles. 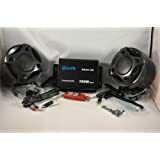 While you can choose any type that you want, handle bar speakers are the most common and this review refers strictly to them. Power is measured in Watts for an audio system and the systems meant for motorcycles make no exception. You need as much power as loud as you want the speakers to be, because having a higher wattage means obtaining a higher volume for the sound. Speakers that are meant for outdoor environments can be either weatherproof, or waterproof. While getting an audio system that is weather resistant can be great for light rain, you will need a waterproof system if you want it to still work when there are heavy rain falls. The input source can be an mp3 player, an iPod, a smartphone or a head unit. While some sources can be the devices that you have on hand, head units are sold with some audio systems for motorcycles. If a set of motorcycle speakers has some extra features, then it is the greatest. You could get more convenient controls that will help you focus more on riding and avoid distractions, or you could get a docking station for the input source. BOSS AUDIO MC400 is an audio system that has a total output power of 600 Watts (300×2) and can be ideal for motorcycles, scooters, boats, ATV’s and any other vehicles that have a 12V power supply. One of the main advantages of the system is the resistance to water. With the two identical speakers (left and right), each of them being of three inches, you get a stereo amplifier system that is suitable for any terrain. The system has stainless steel brackets that can fit handle bars. All the components of the system have been properly coated in order to resist to the effects of bad weather. However, the product is just water resistant, not waterproof. The speaker cones are manufactured from a very flexible material (Polyurethane) that makes them quite durable. Polyurethane is a material that can easily replace plastic or rubber in many applications and it offers the advantage of high durability, resilience and flexibility. The system has a rotary volume control and a wired remote control that is weatherproof. This audio system for motorcycles can also work for scooters, ATV’s, boats, golf carts, etc. It can use the 12V battery as a power source. The package includes a set of identical speakers, an amplifier of 100 Watts, a wireless remote control, cables and brackets that are necessary for installation. The amplifier has an LCD screen that is clear and easy to read. An FM tuner is integrated into the amplifier and has a built-in antenna. The two speakers are completely waterproof. Along with the wireless remote control, there are two other additional features: USB input and an SD slot. The speakers can be mounted onto the mirrors of your motorcycle. They can allow you to listen to music loud enough and the sound is clear. This is a set of 3 inch speakers that is the most powerful of all three systems presented in this guide, as it has an output of 800 Watts. 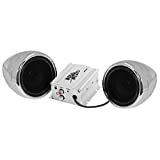 The two identical chrome aluminum bullet-style speakers offer an excellent sound with a full range of frequencies. With these speakers, riding a motorcycle will be a completely new experience. They allow you to listen to music while you ride even in heavy rains or snow, as they are waterproof. You can use the system on motorcycles, ATV’s, snowmobiles and any vehicle that has a 12V battery. The speakers come with mounting hardware that will allow you to mount them wherever you want with ease. The sound produced is clear and loud, but you need to buy an amplifier separately, as there is no amplifier attached to the speakers. This set is a product of Pyle, which is a line of products that are meant for entertainment. You can also get home cinema systems, TV’s, projectors and other similar products from this line.